St. Charles, Illinois - Guyette, Schmidt & Deeter conducted their 27th annual spring decoy auction on April 26 & 27 at the Pheasant Run Resort in St. Charles, Illinois. The auction was held in conjunction with the National Antique Decoy & Sporting Collectibles Show and grossed $2.4 million. The sale pushed Guyette, Schmidt & Deeter total auction sales to over $134,000,000. The crowd was quite large with 277 registered bidders in the audience, another 156 people bidding by phone or absentee and 216 bidders registered online through Artfact. Bidding battles for key decoys erupted continually as many items sold over estimate, and in some cases many times over estimate. Prices were around mid estimate with three lots selling for over $100,000 each and 45 lots selling for over $10,000 each. Items were a little low in the beginning of day one, but were higher as the day progressed. On day two, prices were noticably higher, and once again increased as the auction progressed. World auction records were established for John English (NJ), Oscar Peterson (MI), Jim Schmiedlin (PA), Roy Patterson (IL), Henry Grant (NJ), John Graham (MD), John Cochran duck call(TN), Lloyd Sterling (MD), Noah Sterling (MD), Charles Reeves (ONT), D.K. Nichol (ONT), Charles Perdew duck call(IL), and Benjon duck call (TN). The top lot in the sale was a sleeping mallard hen by Charles Perdew (Henry, IL), which sold within estimate at $181,000. Other Illinois River decoys brought strong prices as well. 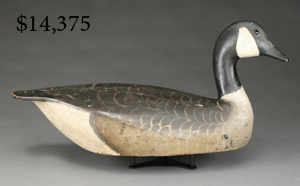 A Canada goose by Charles Perdew sold over estimate at $23,000 and two Charles Walker mallards sold within estimate at $16,100 for a drake and $34,500 for a hen. A John English canvasback drake sold well over estimate at $115,000, a world auction record for the maker. In recent years Guyette, Schmidt & Deeter has been selling significant groupings of fish decoys and duck calls at their April auction. This year a large carved plaque of two partridge in a tree by fish decoy maker and folk artist, Oscar Peterson sold for $123,000, a world record for the maker and four times its estimate. A selection of fish decoys, circa 1890’s from Lake Chautauqua, NY sold over estimate. “This was the launch of a special segmented sale for us titled "The Call Sale". We recognize that there is a very large constituency of organized and passionate collectors of duck calls who are not necessarily followers of our decoy auctions. For this sale we posted multiple photos of all of the duck calls on our website as the calls came in. This gave collectors lots of time to see the photos and descriptions of the calls prior to the catalog being published.”. Duck calls sold very well. A “Duck Head” call by Kinney & Harlow sold for twice its estimate at $24,250 and a rare transitional call by Charles Perdew sold for three times its low estimate at $15,425, an auction record for a Perdew duck call. A John Cochran call sold for a world auction record price of $16,675 and a Benjon call sold for $5,925, also a world auction record for the maker. Gary Guyette noted several factors contributing to the success of the sale. “Our auction catalog is the best and most user friendly in the business and our catalog condition reports are guaranteed. This allows all bidders to participate in the sale knowing that they can rely on those condition reports. Not all decoy auction houses have this guarantee.” The diverse selection in the sale and the firm’s extensive marketing program contributed to the strong prices as well. Guyette Schmidt & Deeter’s next decoy sale will be held July 17 & 18, 2012 in Portsmouth, New Hampshire at the Sheraton Harborside Hotel. Consignments for the sale will be accepted until June 1st or until full.